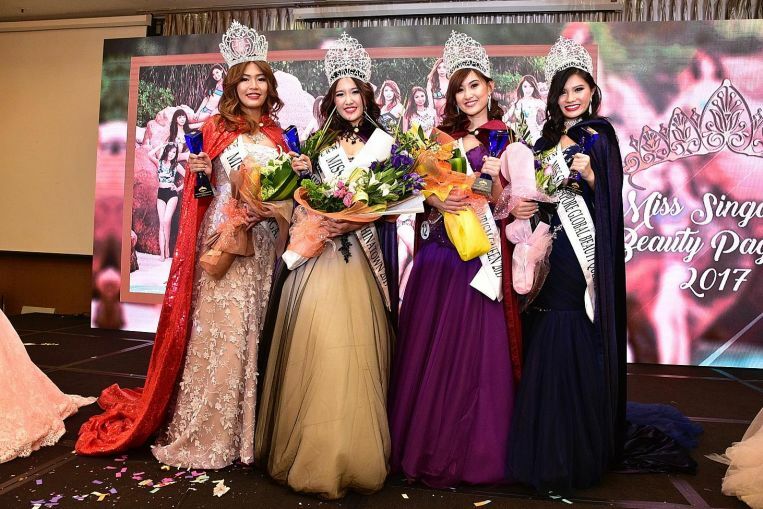 The winners of the Miss Singapore Beauty Pageant 2017 were selected from 18 finalists at the grand finals last night as the event shrugged off some earlier controversy. Last month, an unofficial photo of the finalists brought out the ugly side of some netizens. They commented that the finalists were “not pretty enough” and even questioned if they looked “Singaporean”. Six of the finalists are permanent residents, with three originally from China and three from Malaysia. The pageant is open to Singaporeans and Singapore PRs. Some of the finalists said they had been unfairly targeted and defended their participation, and the event carried on as scheduled at Concorde Hotel to celebrate four winners last night, three of them students. Miss Grand Singapore went to Ms Crystal Lim, 22. Ms Amanda Li, 19, won Miss Singapore Global Beauty Queen, while 18-year-old Christina Cai was picked Miss Singapore Chinatown. Financial consultant Tricia Koh, 25, won Miss Singapore Tourism Queen. Pregnant Model, Sarah Ofili Tie the knot with her Husband in Delta.